Shah Alam is more a residential part of the Greater Kuala Lumpur area than a dedicated tourist destination as such. There is, however, a fair amount to see and do in the city, the capital of Selangor state, and much of the local economy now relies upon tourism. The best hotels and shopping malls are in the centre of Shah Alam, where you will also find quality attractions such as the Lake Gardens and their seven artificial lakes. The massive Sultan Salahuddin Abdul Aziz Mosque is the main draw card in the city and you will spot this place regularly promoted in any tourist information bumph. If you have chosen Shah Alam as a place for a holiday, then there is certainly enough in the city and its surrounds to occupy your time. Located on the northern side of the centre is the Malaysia Agriculture Park (Taman Pertanian), where gardens contain impressive collections of cacti, orchids and bamboo, while there is also a small zoo based here, as well as the SkyTrex Adventure and its jungle canopy bridges and swings. The climate of Shah Alam is reliably hot all through the year and sees daytime temperatures regularly exceeding 30°C / 86°F. This means that the extremely family friendly Wet World at the Lake Gardens is always very popular and a great way to cool down during the heat of the day, with its fun tunnel water slide and Atlantis City being big draw cards. Lying on the easterly outskirts and within the neighbouring suburb city of Petaling Jaya, the Sunway Lagoon Theme Park is another enticing attraction, with an enormous man-made surfing beach and slides at its onsite Water Park. Also at the Sunway Lagoon is the Extreme Park, with power-jump bungees, vertical wall climbs and all terrain vehicles, along with monkeys and other exotics within its Wildlife Park, and Wild West themed rides and roller coasters at its resident Amusement Park. Close by, the Shah Alam Stadium is simply vast and can accommodate some 80,000 spectators, regularly hosting important football matches and other events. More information about Shah Alam Tourist Attractions. Any sightseers visiting Shah Alam will of course want to experience the Sultan Salahuddin Abdul Aziz Mosque (Masjid Sultan Salahuddin Abdul Aziz) in the flesh. This iconic 'Blue Mosque' is able to hold well over 20,000 worshippers within its cavernous interior. Outside tourists will discover four rocket-like minarets, which are actually amongst the tallest minarets anywhere on the planet, and an azure-blue dome, also of epic proportions. When you step inside, it is worth noting that you will need to be dressed in an appropriate manner and adopt the dress code of no shoes, arms and legs covered up, and a scarf for ladies. As well as the mosque, there are a handful of other noteworthy landmarks spread around the city of Shah Alam, such as both the eye-catching Selangor State Assembly Building and the Perpustakaan Tun Uda Library. More information about Shah Alam Landmarks and Monuments. Although this city may well be the state capital, its cultural offerings are far from extensive and for the best museums you will really need to take a day trip to nearby Kuala Lumpur, just a 30-minute drive away. However, if you don't have the time or simply want to see what Shah Alam has to offer, then the Selangor State Museum is a good place to start. Here you can enjoy a large collection of regional artefacts, state information, scale models of buildings and themed exhibitions at its Cultural, History, Islamic and Natural History galleries. Within walking distance of the Sultan Salahuddin Abdul Aziz Mosque, the Selangor Islamic Arts Complex is a good place to learn about the sacred writings and calligraphy of Islam. The Shah Alam Gallery completes the city's main cultural attractions and boasts an assortment of Malaysian art works, traditional handicrafts and some locally made textiles. More information about Shah Alam Museums. Most people holidaying in Shah Alam choose to spend time in Kuala Lumpur, since Malaysia's capital is within such close proximity and features endless sightseeing, shopping and dining opportunities. 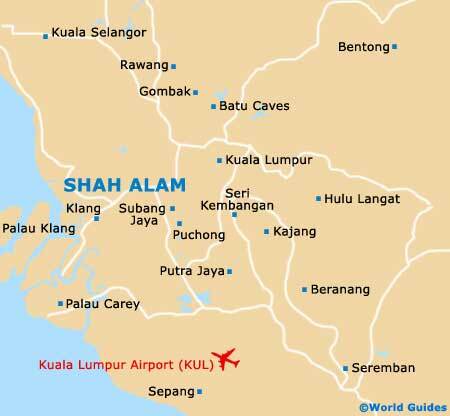 Slightly closer to home is the city of Subang Jaya, sandwiched in between Petaling Jaya and Puchong, where the Sultan Abdul Aziz Shah Airport is located, and also some major shopping malls. Lying within the Klang Valley is the town of Klang, where stylish architecture, fine dining and the hilltop Sultan of Selangor's Palace (Istana Alam Shah) all serve as tourist magnets. Putrajaya, the busy administrative capital, is also within comfortable reach of Shah Alam and offers day trippers a pleasant mix of spacious boulevards, grand monuments and big mosques, together with the Palace of Justice (Istana Kehakiman) and the Putrajaya Convention Centre. The coastal town of Kuala Selangor is another worthy excursion and is where you will find the elevated remains of the 19th-century Bukit Malawait fortress. You may also like to come to Kuala Selangor to spend the day at the Taman Alam Kuala Selangor Nature Park, checking out the mangroves and watching the inquisitive macaque monkeys. More information about Shah Alam Attractions Nearby.